Just thought I would share a few of my recent Spellbinders Blog projects, that’s about all I’ve crafted lately. My J.O.B. has changed and morphed since I took it on last June. Seems that every time I catch up, there’s something new and different learn and figure out. No complaining, I’m happy to have a job I love with a company I love. So here is a project that I LOVE! 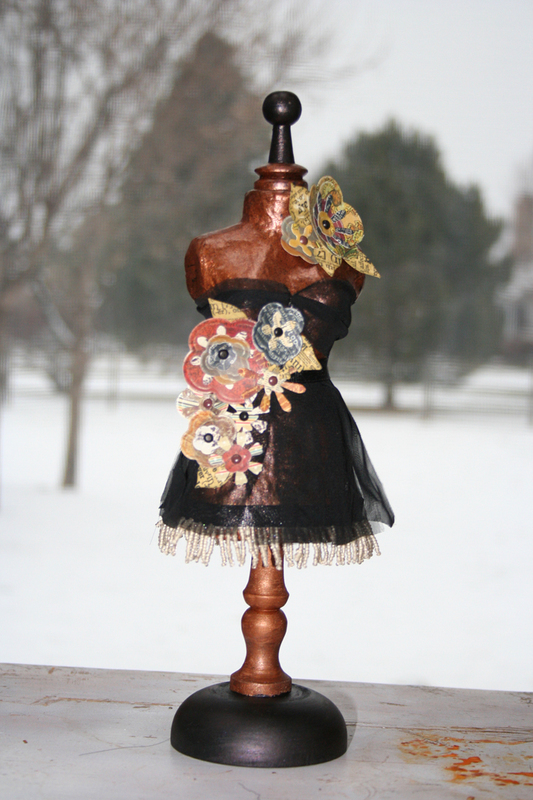 I have had that dress form in my studio for like 2 years, and was saving it for just the right inspiration. I had placed it on the desk so many times, intending to use it and it just never spoke to me until recently. Here is the finished project, and the instructions are here. 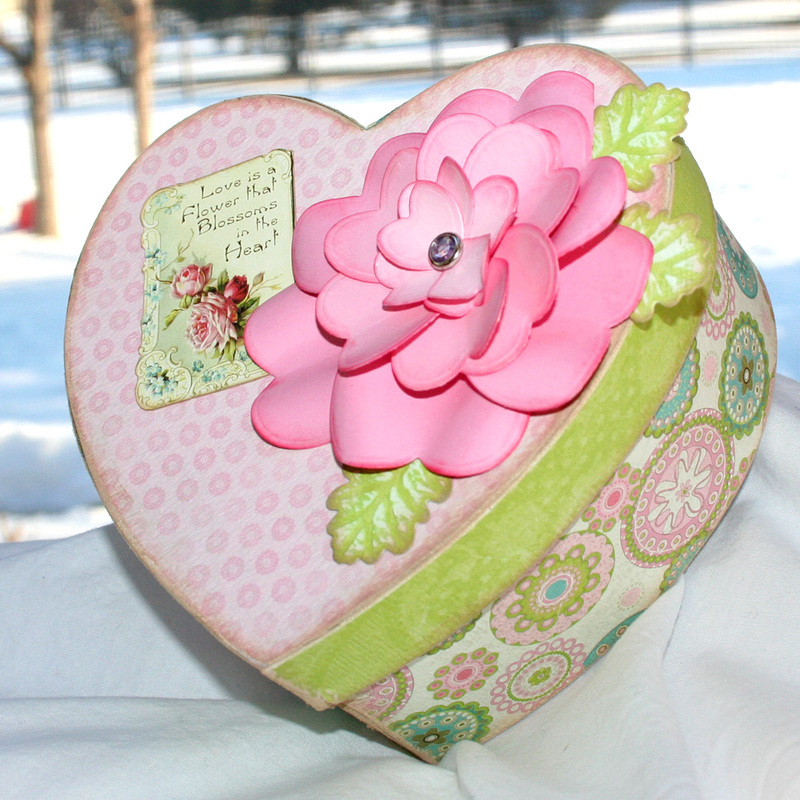 Then around Valentines Day I did this box, pretty simple, and used up some pink paper. I ended up with a lot of it and really don’t have many pink inspirations moments. It’s the darker colored stuff that I hoard. Details here. Both projects used the new Spellbinders Presto Punch System. It’s super cool and easy to use, and will be available in stores in late April! I’m feeling a retail therapy day coming along, as well as an outside run. My sister seems to think I am a runner, and I have signed up to run my first race, an 8K, and its coming up quickly! Hitting the treadmill at the gym is not like hitting the pavement. She thinks I should do a half~flipping~marathon with her in the fall. Color me wishy-washy on that. So this is very wierd for me, bear with me. I have gotten a few Facebook friend requests from people I don’t know, and i feel terrible saying no, but I really don’t talk shop on my personal FB page. I decided to start a Cookies For Breakfast fan page. So here’s the deal, you can be a fan there, I’ll post random and regular stuff there too- emphasize the regular because I am on FB daily. We’ll see how this goes, gosh I have a fan club, I think?? There’s not much there yet, but I will work on it, really I will. After 25 fans I can get a permalink! A few updates: Evan’s forever family is waiting on the final word from China, the one the says “book your airline tickets!” So very excited for them, and I get to meet him too! Cindy is fat and happy, very very happy these days. I did a photo montage of her on Facebook, you don’ t have to be a member to see it, so just click here and enjoy. The Christmas/Valentines/Birthday tree in the foyer is down. Can someone please put it in the crawl space, or do we have to trip over the body bag for another 2 3 months? This entry was posted in Altered Art/Mixed Media, Cindy, Spellbinders and tagged Evan, Facebook, Presto Punch, Spellbinders. Bookmark the permalink. OH….. but you will be running that half marathon in the fall…and thanking me for dragging you out there! beautiful work, Beth! Love the dress form!